The project team and members of the wider community are involved in a number of scholarly initiatives related to our work here at The Programming Historian. These include events, journal articles, reviews (of us by the community), and posters. If you are conducting academic research using this project please Adam Crymble. William J. Turkel and Alan MacEachern, The Programming Historian 1st edition (Network in Canadian History & Environment: 2007-2008). Katrina Navickas and Adam Crymble, ‘From Chartist Newspaper to Digital Map of Grass-roots Meetings, 1841-44: Documenting Workflows’, Journal of Victorian Culture, (2017). Shawn Graham, Ian Milligan, and Scott Weingart, Exploring Big Historical Data: The Historian’s Macroscope, (Imperial College Press, 2015). Adam Crymble, Maria José Afanador Llach, José Antonio Motilla, ‘Digital Humanities Skills for Latin American Scholarship’, Universidad de los Andes, Bogotá, Colombia (1-3 August 2018) - funded by the British Academy. Victor Gayol, ‘Introducción a las Ciencias Sociales y Humanidades Digitales. The Programming Historian en español – COLMICH’, El Colegio de Michoacán (September 2017). Fred Gibbs, ‘Digital History @UM: The Programming Historian’, University of Michigan (27 January 2017). Adam Crymble, ‘Enhancing Digital Skills Applied to History’, North-West University, Vanderbijlpark, South Africa (20-22 June 2016). Adam Crymble and Justin Colson, ‘Intro to Geocoding’, Institute of Historical Research, London, (19 April 2016). Carys Brown, James Baker, Adam Crymble, ‘Defining Effective Digital History Mentorship’, University of Cambridge (15 March 2016). Adam Crymble, ‘Intro to Data Mining’, Institute of Historical Research, London (2 February 2016). James Baker, ‘Programming Historian Live’, Software Sustainability Institute, London (19 October 2015). Adam Crymble, ‘Python Programming for Humanists’, Day of Digital Ideas, University of Edinburgh (26 May 2015). Jennifer Isasi, Antonio Rojas & Anna-Maria Sichani, ‘Data science and the language question in digital humanities pedagogy: the example of the Programming Historian’, EADH 2018, National University of Ireland, Galway, 9 December 2018. Afanador, Maria José. ‘The Programming Historian en español: estrategias y retos para la construcción de una comunidad global de humanidades digitales.’ Ponencia presentada en la Conferencia de Humanidades Digitales DH2018, Ciudad de México, México, (2018, junio). Caleb McDaniel, ‘Open Access, Transparent Peer Review’, Annual Meeting of the Organizations of American Historians, Sacremento, California, (14 April 2018). James Baker, ‘The Programming Historian: Open Access, Open Source, Open Project’, Research Hive Seminar on ‘Open publication: exploring alternative models and practices’, University of Sussex (22 March 2018). Adam Crymble, ‘White, Male, and North American: Challenges of Diversifying the Programming Historian’, Université de Lausanne, Switzerland (23-24 March 2017). Victor Gayol, ‘La investigación del pasado y la historia digital: análisis de datos y cómo aprender (The Programming Historian en español)’, Humanidades Digitales, IV Feria Internacional de Ciencias Sociales y Humanidades, Centro Universitario de Los Lagos - Universidad de Guadalajara, Lagos de Moreno, Jalisco (9 March, 2017). Victor Gayol, ‘The Programming Historian: ‘un modelo colaborativo para la investigación y la ensenñanza en ciencias sociales y humanidades digitales’, Mesa de Trabajo sobre Ciencias Sociales y Humanidades Digitales, El Colegio De Michoacán, Mexico (21 February 2017). Adam Crymble, ‘Bringing Digital Humanities into the University for Free’, University of Cape Town, South Africa (27-28 June 2016). 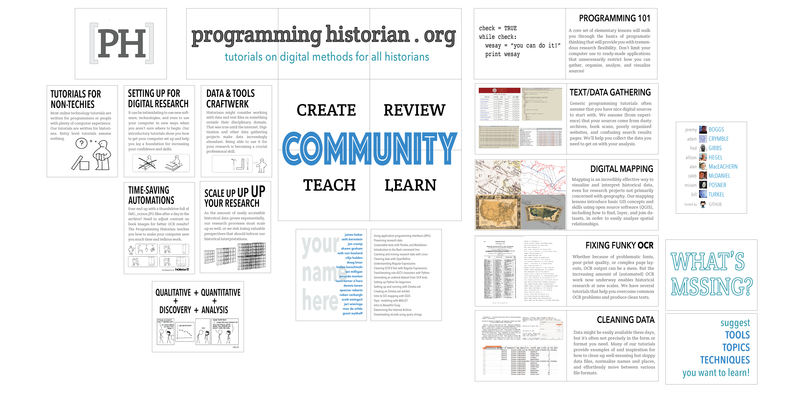 Fred Gibbs, ‘The Programming Historian’ (Poster), American Historical Association, New York (January 2015). Adam Crymble, ‘The Programming Historian 2’, Digital History Seminar, Institute of Historical Research, London (13 October 2013). Adam Crymble, ‘The Programming Historian 2’, Digital Humanities 2012, Hamburg (July 2012). Adam Crymble, ‘A Decade of Programming Historians’, Network in Canadian History & Environment, 23 March, 2018, http://niche-canada.org/2018/03/23/a-decade-of-programming-historians/. Anaclet Pons, “The Programming Historian en español”, Clionauta: Blog de historia, June 14, 2017, http://clionauta.hypotheses.org/16979. Seth Denbo, “Historian, Program! Self-Help for Digital Neophytes,” Perspectives on History: The Newsmagazine of the American Historical Association, May 2017, https://www.historians.org/publications-and-directories/perspectives-on-history/may-2017/historian-program-self-help-digital-neophytes. Víctor Gayol, ‘The Programming Historian en español’, Blog de Humanidades Digitales, March 17, 2017, http://humanidadesdigitales.net/blog/2017/03/17/the-programming-historian-en-espanol/.